Default days are over! You can now personalise your Contracts list screen to view only the columns important to you. You can also rearrange the columns to fit your custom view and apply filters for fast and easy access to specific information. Find out more about the filtering features below. Using the filter function you can customise your screen view by adding or hiding columns to your report, as well as arranging these columns in the best order for you. You can enhance the customisation by using filters to search for contracts with specific fields such as a commodity, season, date or quantity. Customised reporting filters can be saved as a preset, at a personal or organisation level. This allows you to save various reports for every section of your business, accessible anytime across your entire team or for personal view. Search and sorting functions have been improved to provide faster and more flexible filtering. The search feature has dynamic search capacity, delivering more accurate results, while the sort feature gives you more control over the Contract screen view. 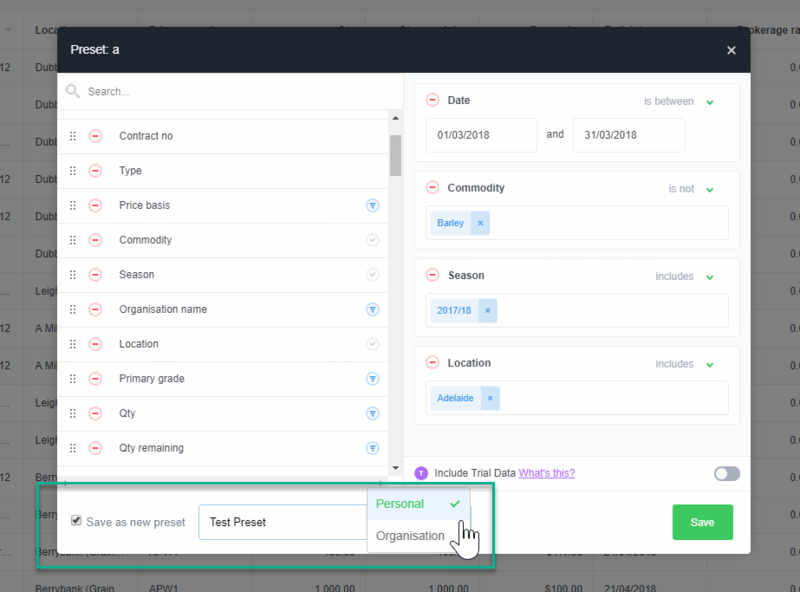 When exporting your preset view from your Contracts list screen, only the selected data will be exported, allowing you to easily create personalised data reports. Stay tuned for more filter and search functionality across your other AgriDigital features!